Yes, following on from yesterday's icy post, isn't the weather a bit queer in the northern hemisphere? Gosia reports from Poland that there has been little snow there. Walt and Ken similarly have had little snow. Marie in London managed to find a pond partly frozen over in outer London. So The Thames is not freezing over this year? It has been a long time. John Gray of Wales complains of biting cold winds and rain, but not snow. Gattina complains about the constant rain but it is not very cold in Belgium. The Tyne River where R grew up used to freeze, but it doesn't now. Strayer in north western America moans on about the rain, but not snow. But even here in Victoria, way down south in Australia, our summer has been delightfully cool. The 2016 summer has seen no multiple days of 40 degrees, let alone one day, and we are already two thirds through February. It can still be hot in March though. Perhaps it will be a late summer. Easter in southern Australia can be very cold or very hot, or sometimes very wet. All very odd, but of course nothing to do with global warming. Well, dreams of Portugal are off the menu. R's sister's husband is not terribly well and does not want to travel. We are looking at a Mediterranean Sea cruise later in the year. I can't believe how cheap they are, even on a Cunard ship. My holidays are flexible and I can match them to what we want to do, but the uncertainty was preventing us from doing anything. I sorted my holidays out yesterday and while we have discussed so many different places to go, we have decided on a big holiday later in the year and a brief local holiday in April. The more we looked at Perth, the capital of the Australian state West Australia, the more we liked the look of it. We had already considered catching the Indian (ocean) Pacific (ocean) train but everything we read put us off. After Canada, I thought two days on a train is long enough. This is not a firm view and could well be revised if we travelled on the Orient Express. So, in Perth we have booked an apartment in Mount Street for eight nights (oh, Mount sounds like a steep hill. We are from Melbourne and we don't do hills) and with airfare, about $1000 each. That gives us six full days. It is a long day, but we will take a coach tour to Margaret River. We will river/sea cruise to Rottnest Island for a day trip. We will travel by train to the port city of Fremantle at least once, maybe twice. It is only thirty minutes away from Perth. The rest of the time will spent seeing things around Perth. Cottesloe Beach with its Indiana are must sees and Hillarys Boat Harbour is high on the agenda. We will be very close to King's Park and the new Elizabeth Quay is not too far away. We are really quite excited about our mini holiday. R has been to Perth before, but I have not. I guess Grace with her Perth Daily Photo was the clincher for me. I have seen so many beautiful and interesting things via her photo blog. While I knew about the relatively new train to Mandurah, I did not know that it was underground in Perth city. I like to visit a public transport museum when we holiday, and I believe the one at Whiteman Park is quite good, but when? Our days are already filled. It is never a bad thing to leave yourself wanting when you holiday. You can dream of returning, even if you never do. I should have included these photos when I posted about the Comic's Lounge. I rather like Errol Street in North Melbourne. It is a short street but full of character both visually and people wise. I think North Melbourne is now within the City of Melbourne, but this is the old North Melbourne Town Hall. The old post office adjoins. I think Comic's Lounge, in spite of the dodgy apostrophe, is a pretty terrific venue; promoting comedians of all levels nightly. I expect every Australian comic has performed here. Hippie niece was not looking so hippie this evening. She wanted ice cream with her dessert, so she ordered it and wasn't told that her dessert already had ice cream. Communication breakdown. She was not at all fazed by the extra icecream and happily consumed the lot. Firefighters easily work off excessive kilojoules. While there are plenty of medium rise new buildings in North Melbourne, Errol Street remains quite unspoilt. Look closely, even people living above shops. Wonderful. You have probably heard of the Google self driving car. Apparently Apple too has been employing engineers of the type who can design and build a car. I hope Microsoft don't join in. Can you imagine the paper clip assistant popping up; It looks like you are driving a car. Would you like some help with that? Then again, it might be good if it said, It looks like you are in a traffic jam. Would you like some help with that? I doubt we will ever see self driving cars on our roads en masse. There have been a number of accidents involving the Google self driving car, not usually a direct fault of the car though, perhaps more its un-human like behaviour. Here are a couple of instances. One involves entering and merging on a freeway. Australians used to be quite poor at this skill but I think it is one skill that has improved over the past couple of decades. Thank goodness something has improved as every other driving skill seems to have gone backwards. So, heavy traffic on a freeway. The driver entering the freeway speeds up to the speed of the traffic on the freeway, indicates and someone will drop back a little or change lanes to let them in. Usually! The last thing you want to do is slam on the brakes because there is no obvious gap but that is what the Google car did. It could not see a gap to merge into, so it simply came to abruptly stop with probably bang, bang, bang behind it. Another problem, a road with a single lane in each direction. A cyclist is riding along and there is insufficient room to pass the cyclist without moving a little bit into the opposing lane, which is what drivers would normally do once there was nothing coming the other way. Not so the Google car. It will not cross the white centre line so it just sits safely behind the cyclist. Cyclists may well like this aspect of the Google car but as the line cars grew behind the Google car, drivers would become very frustrated and start taking risks. While we won't see self driving cars for a long time, well not cars as we know them, what we will see and are already seeing is lots more driver assistance. There is already braking radar, lane drift warnings and many other features to help drivers. There will be more and more of this type of driver assistance and it will become very sophisticated. 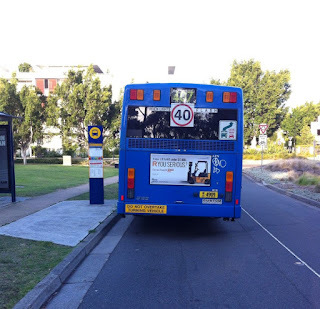 I recently heard of a car in Sydney that could read speed limit signs and adjust its speed accordingly. Sounds good? 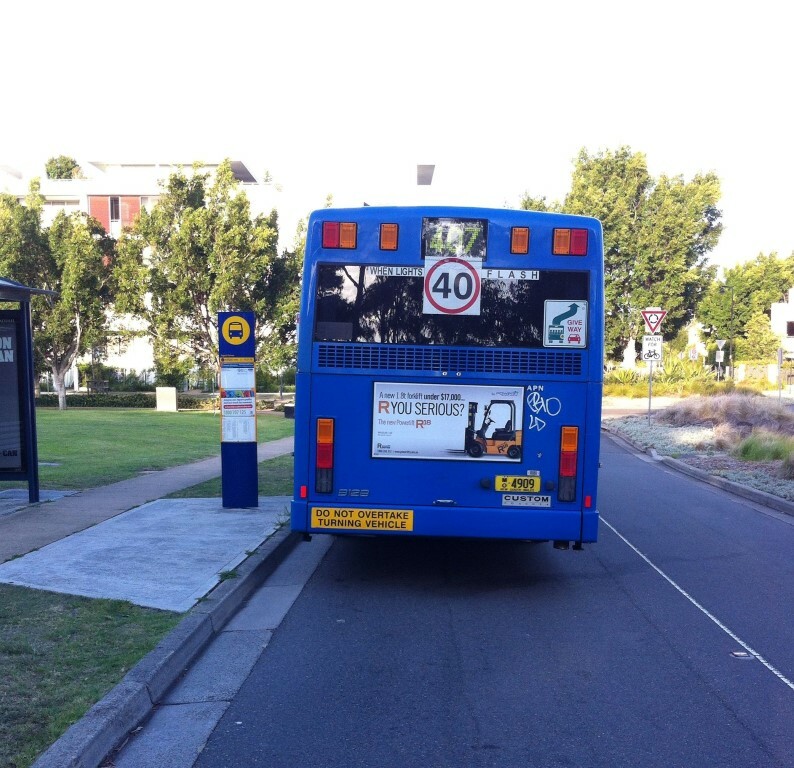 Until it came up behind a Sydney bus with the warning to pass the bus at 40 km/h if the lights are flashing. The car read the forty as a normal speed limit sign. 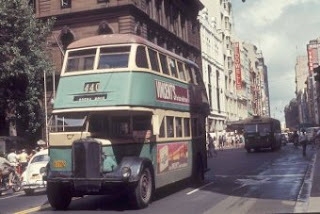 Sorry, this is a gratuitous photo of an old Sydney double decker. I'll try again. There you go. Got it right now. River's Musical Monday will come without the depressing accompanying text. I follow my own advice, so when I am feeling a little blue or sad, I look at Happy clips from around the world. I looked at the one featured below last night just before sleeping. It is a Vietnamese clip, so my Thai friend informed me. But it was filmed in Thailand. Duh, that's what it says in the information. The guy in clip is quite attractive. I wondered who he is. I still don't know. I remarked to my Thai friend about the largess of fashion, beauty and style in the clip, which quickly brought us to a brief discussion of the rich in Asia. In each respective Asian country, they are a world apart from the ordinary person. Their self indulgence knows no bounds. They are totally insulated from the normal Asian person's life in their countries. The gap between the rich and poor in Asian countries is obscene, yet that is what western countries are regressing to. I won't be around to see how bad it becomes here, but it will get quite bad. Gawd, I have just depressed myself even more, so I better watch another Happy clip. Damned American import, it is. That's Valentine's Day. I have been forced to participate in the event and I swap cards with R. Please, I show my love every day as I push buttons to do our washing. I am just brilliant at using a washing machine. No, don't mock me. It is rare that I do anything less than a full load. I manage the water temperature as I am not happy with what the machine does. I buy huge quantities of detergent and fabric softener at cheap prices. Tea towels don't go with socks and jocks. Light colours don't go with dark. Towels are washed on their own. Food stains are dealt with by soaking. Auntie Andrew is a really good washer woman. Now I have lost my train of thought. Oh yes, Valentine's Day. Bah humbug. That was until I saw a nice looking blond lad of about 18 years old wearing standard pink shorts, a dressy shirt with a narrow loose tie, with who I guess was his attractive girlfriend. He was carrying a large wicker picnic basket and they were heading for the Botanic Gardens, no doubt for a large repast from the basket in nice surroundings. Instead of thinking, idiots, it will all go bad before you can turn around, I felt all warm and gooey. May their romantic innocence and naivety go on forever. Joining River and others for Sunday Selections. Oh, the roneo machine is nearly out of metho so this week's copies will be brief in an effort to make sure there is a copy for you all. R bought this potted impatiens a couple of months ago. I suggested it would not do well on the balcony with the fiercely hot morning sun over summer, never mind the wind. I took it upon myself to care for it and care for it I have. If it is to be a hot and sunny morning, I bring it inside. I water it as required, usually every second or third day. It has been brilliant and positively glows in the evening light. The spent flowers spin as I throw them over the edge they blow off and slowly descend to the ground below. 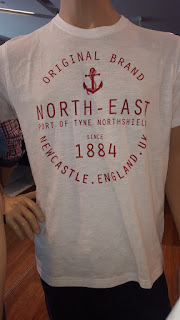 Well, this was a surprise, a Geordieland tee shirt seen in the department store Myer. Newcastle is of course R's city of birth. They did not have it in a small size so R could not buy one for himself (Victor, it's not the time or place for honesty). I had not seen a rainbow for a while. Interesting light in the photo. And a sunset photo, again with interesting light probably caused by air pollution. I am the original romantic, hey.